KMELB2017 – Creativity, Chaos and Collaboration, a knowledge management (KM) conference inspired in part by a Business Information Review paper1, was a partnership between three organisations: the Australian Society for Knowledge Management (AuSKM) represented by the President, David Williams; KnowQuestion’s Stephen Bounds and myself; and Arthur and Cath Shelley from Intelligent Answers. Our aim was to create a conference that not only explored the catchwords and hashtags of the moment, but would be a shout out to the KM profession to step up and act collaboratively. Ron Young, the keynote speaker and CEO of Knowledge Associates Cambridge Ltd, a KM and innovation consultant with a deep understanding of the complexities facing organisations, laid down a challenge to the profession. 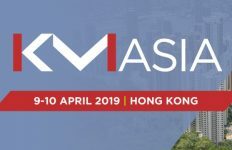 Ron called on us all to create a unified, global professional KM society with vision, values, a code of ethics and an agreed professional practice, with a body of knowledge and a set of core competencies, leveraged on a global platform. Our knowledge assets are our human potential, and managing ourselves effectively as a body of professionals, not solely in the service of the organisations in which we work, should engage us all. 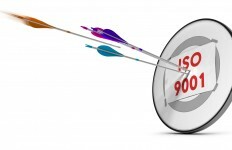 Citing organisations that get KM right in life or death situations like the airline and automotive industries, Ron suggested that as a profession we don’t get it right as often as we should. 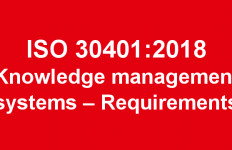 Ron sees the draft ISO 30401 Knowledge Management Systems Standard, to which he has contributed, as a real opportunity to get it right for the profession, and to make significant progress in embedding KM in our organisations. #KMELB2017 included speakers and workshops from members of the Australian Society for Knowledge Management (AuSKM) leadership team including David Williams, Arthur Shelley, Marie O’Brien, Michelle Lambert, and Nerida Hart. Delegates were able to listen to and engage with the speakers throughout the two days. At the end of the first day, the conference also hosted the AuSKM AGM, as AuSKM consolidates into a national body which encompasses the strong state-based groups of actKM Forum, Melbourne KMLF, Adelaide KM, NSW KM Forum, and QKM Forum. Rather than lamenting the demise of KM, we came away invigorated and challenged to craft its next iteration. We are already looking forward to #KMELB2018 and your participation in it! 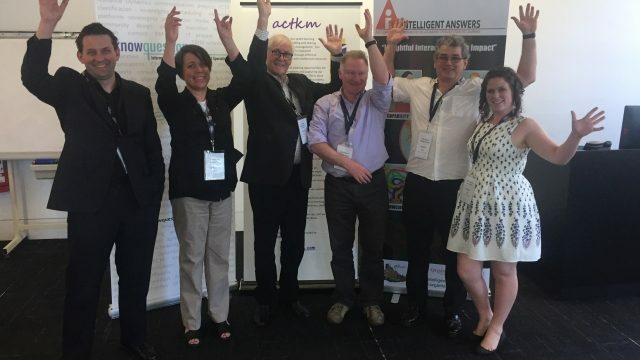 Header image: The KMELB2017 conference team (from left to right): Stephen Bounds (KnowQuestion), Amanda Surrey (RealKM Connect), Ron Young (Knowledge Associates Cambridge Ltd), David Williams (AuSKM – Australian Society for Knowledge Management), Arthur Shelley (Intelligent Answers), Cath Shelley (Intelligent Answers). Image credit: Keith De La Rue.